I had a long career in special events, and was trying to figure out my next move after spending 10 years overseeing special events and celebrity dressing for Coach. I knew I didn’t want to go in house for another brand as Coach had my heart, and also I knew I didn’t want to continue to work at a traditional corporate job. Our longtime caterer at Coach was looking to make a change and after a few long lunches we decided to launch a catering business focused on the fashion and luxury world. Business boomed, we had amazing cooks and servers, but my partner and I were oil and water. What should have been an inspiring, collaborative time quickly turned hostile, and then I found out I was pregnant with my second child, and decided to sell him my shares of the business and take a step back to reevaluate. 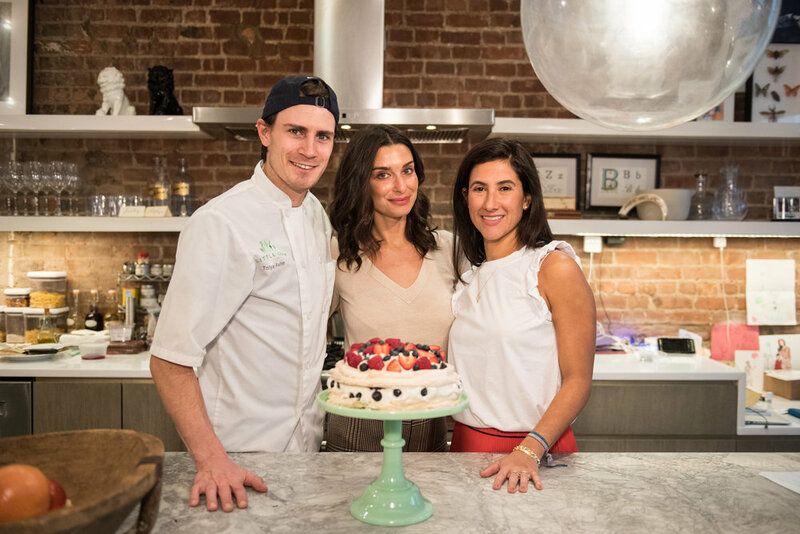 About two months later I was discussing my next move with my friend Marshall Heyman, the writer and theater producer, and he suggested that I meet Tolya Ashe, a private chef looking to expand his business who was also, more importantly, a lovely human being. Tolya cooked for me a week later, with my husband Justin, and his sisters Alexi and Ariel at the table, and Little Gem was born from that dinner. There were so many valuable learnings from starting my first company that we could grow from, as well as colleagues and clients that wanted to support both of us. We slowly and steadily grew, starting with small events that Tolya could cook from home, and very organically the phone started to ring. About a month into our launch my former partner went out of business and then all of my staff and cooks who I loved so dearly joined us at Little Gem, and the rest is history. That I was the client for so many years. With other catering companies, you get the sales team writing your menu, and then a different cook at each event. 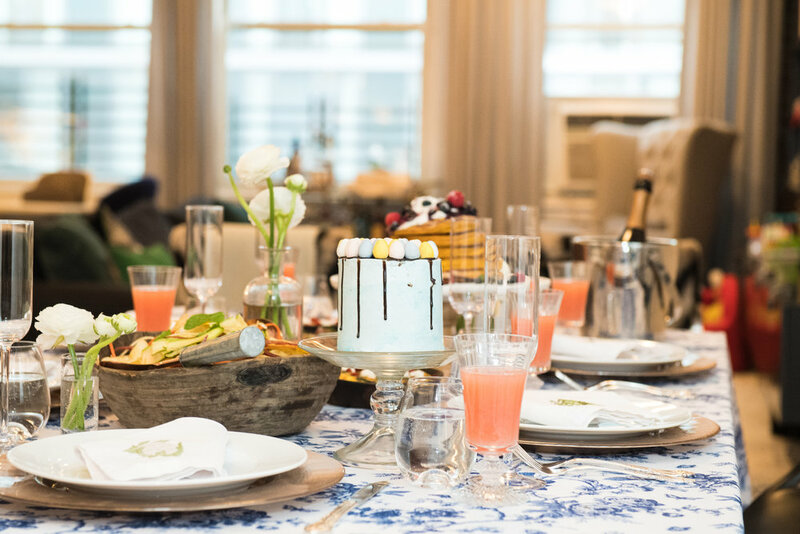 My clients get me – from the first call until the event recap – and because I spent 15 years on the other side of the kitchen, I really understand what they are looking for from their caterer. Tolya is also incredibly personable and loves to interact with the guests when appropriate, or teach the host cooking tips and tricks, and I haven’t seen that happen with other caterers. He brings the customization you get with a private chef, but with the bells and whistles of a larger catering operation. That’s the hardest part, staying relevant and top of mind. With food, everyone always wants what’s new, or trending. We change our menus every 3 months to keep them seasonal and exciting, and we also rely heavily on Instagram to show our current and potential clients all of the exciting things we are working on and the new clients that we have acquired along the way. Feeding people is not just the foundation of entertaining, but its something we all participate in every day, so I love that we can take that mundane experience and make it special, memorable, and different. We help our clients bring people together for a unique occasion and hopefully make that meal an event that they wont forget. When we bid against a well established caterer and get the job. It’s a high like no other, knowing that we are making a ripple in this crazy, competitive city. Also, when a client calls us that found us on Instagram because social media intimidates me and that means we are doing something right and all of those hashtags are actually working! I like to think of myself as a concierge, so I’ll keep this list related to food: Two Guys from Woodbridge at the Farmer’s Market for salad greens, Sahadi’s for spices, Whitmans for dinner with the kids, Mini Melanie for pastries, Dipaolo’s for cheese. And my favorite place to dine, when Tolya is cooking, is the bar at Blue Ribbon where James makes the best martinis. We have many moms who use our healthy drop off service as replacement for weekday lunches and dinners. It’s such a better, and tastier, alternative to ordering in, and I don’t know many moms who have the time to cook on a weekly basis. We also have moms who like to pretend they made our food and use it for a casual dinner party, and nobody is the wiser. 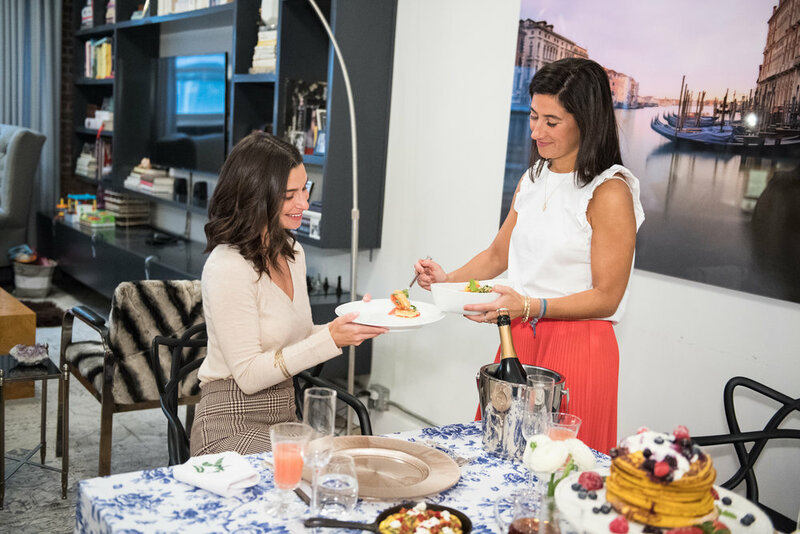 We recently catered for a private client who we had worked with before, but this time Little Gem was hired by the matriarch of the family, who was a seasoned hostess and had experience with many of our competitors. After the event, she called to tell me that our food was delicious, and that our staff went above and beyond to make her feel taken care of and to leave her home cleaner than they found it. She told me she would tell all of her friends how wonderful we are, and I got a call from one of those friends the very next day. That whole experience really stayed with me, from providing a great meal, to having my servers act professional and gracious and go beyond their job, and ending with the hostess understanding how important word of mouth was to a new business. For a true special occasion I unequivocally recommend Bronson Van Wyck. His taste level is unparalled, there is nobody more creative in our business and his business partner is his Mom which is so sweet. We have been working together for close to 17 years (!) and he continues to impress me with his innovation. And the two catering companies that give us a run for our money are Poppy’s and Bite. Jamie at Poppy’s has mastered the farm to table menu and aesthetic, and Scott at Bite does the most genius things in the kitchen. The flavor combinations that he comes up with are mind blowing. Before you go to bed, fill the coffee maker with La Colombe and set the timer for 630am.